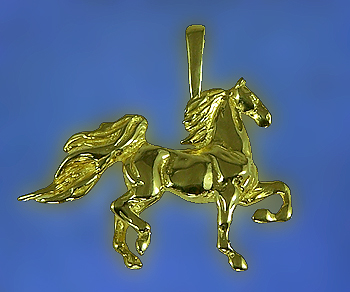 A true all american Saddlebred pendant. The Gorgeous Horse is your source for the best Saddlebred jewelry on the market today. An absolute favorite for me! This gaiting beauty captures the Saddlebred at it's finest moment. Fantastic weight and three dimensional solid cast brings this horse to life. A treasure that will last a lifetime. Dimensions: 1 1/4 inches wide x 7/8 inches tall. Available in 14kt yellow gold, 14kt white gold, and sterling silver. PICTURED AND PRICED IN 14KT GOLD!